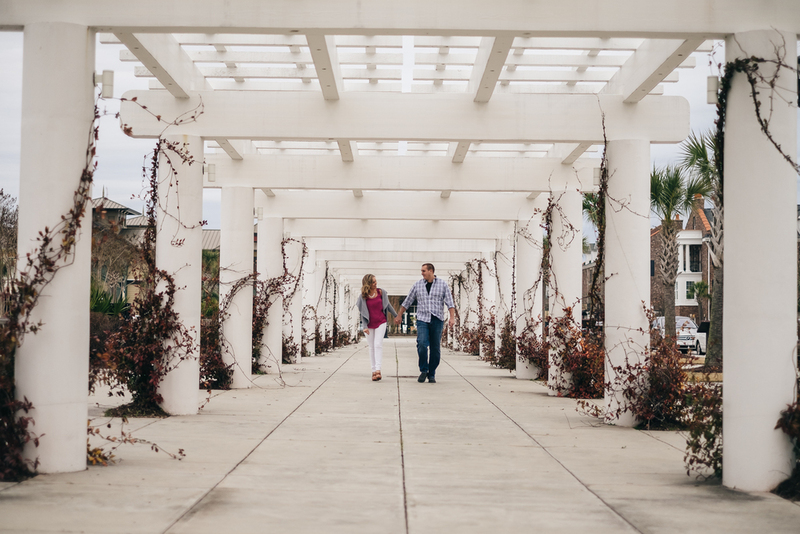 Trisha + Pat, two newly engaged Myrtle Beach visitors, wanted their engagement photos to portray themselves in a place they enjoyed: the Market Common. This location has proven to be simple, yet diverse in all that it has to offer. Having little to no setup time, the Market Common is packed with photography gold, ranging from modern colorblocked walls to the natural serenity of Valor Park. On top of that, shots of warm brick, walls of ivy, column-and-lattice walkways, and flowing fountains offer stunning backdrops to couples of every kind, for any occasion. Located very near Surfside and Murrells Inlet, Trisha + Pat felt right at home in one of their favorite destinations nestled in the heart of the Grand Strand. While most people commonly associate Myrtle Beach with summertime fun, Trisha + Pat’s engagement session took place on an absolutely freezing day in February. Despite the cold, we wanted to ensure that their photos captured the classic warmth of Myrtle Beach because of their August wedding date. Luckily, their radiant love coupled with the year-round greenery of the Market Common made this wintry shoot both warm and fun. Congratulations Trisha + Pat! Interested in having unique and special engagement photos taken? Contact Jarrett Hucks Photography today to schedule to exciting session!